Fuel cells in all applications require hydrogen to operate. To take advantage of fuel cells’ clean operation, this hydrogen must be produced sustainably. Today, clean hydrogen production is synonymous with water electrolysis using renewably produced electricity. To complete our offering of hydrogen technologies, Swiss Hydrogen will propose efficient electrolysis systems for gas production. For transportation applications, we also offer consulting services for the design, construction and operation of hydrogen fuelling stations. 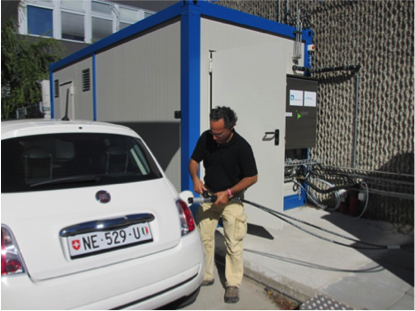 At Swiss Hydrogen SA, we have operated our own complete hydrogen fuelling station since 2012. A photovoltaic system on the roof of the company offices contributes energy for the hydrogen production.